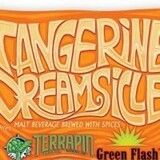 Terrapin and Green Flash have teamed up to make a tangerine cream IPA that will tickle your inner child while it satisfies one of life’s guilty pleasures. East meets West with the coolest collaboration brew in recent history. Perfect served on a hot day off the back of a musical truck…best if you had to chase it down a block or two first.